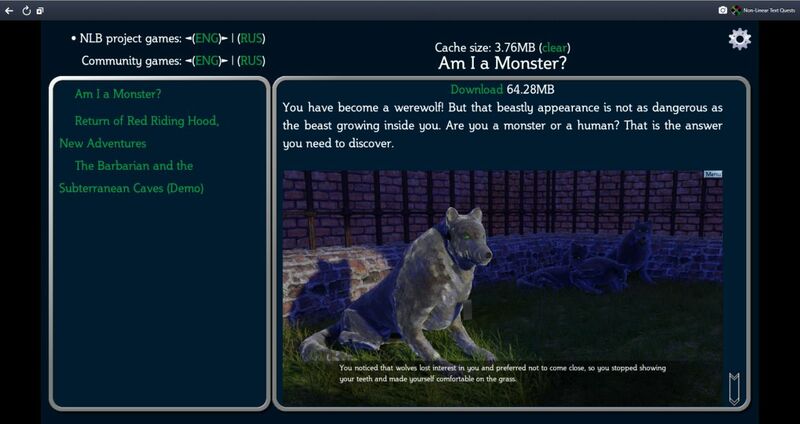 Non-Linear Text Quests was supposed to be a bundle with Return of Red Riding Hood, New Adventures as a main game and Am I a Monster? as additional game. But then we remembered about other great games we once played. We were pleased to find out that their authors agreed to include their games in our bundle. 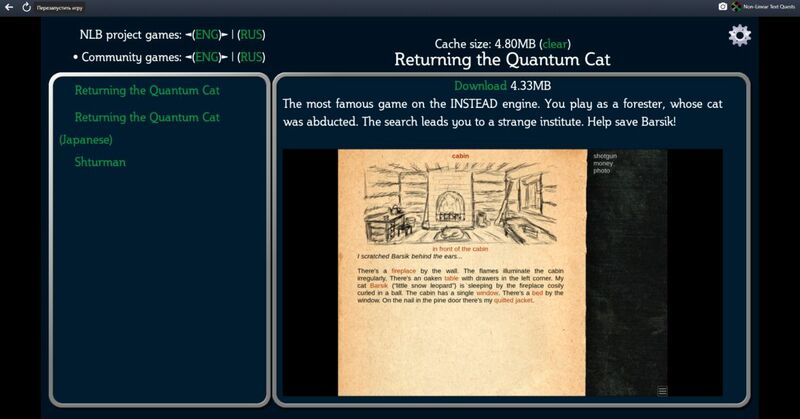 So we added a Community games section to the main menu with the following games: “Returning the Quantum cat”, “Watch”, “Shturman”. Return of Red Riding Hood, New Adventures is a non-linear comic story which has a text quest for the first part and a visual novel for the second part. The game characters were borrowed from the well known tale Little Red Riding Hood by Charles Perrault. Our goal was to create the most non-linear plot with lots of different paths and choices. 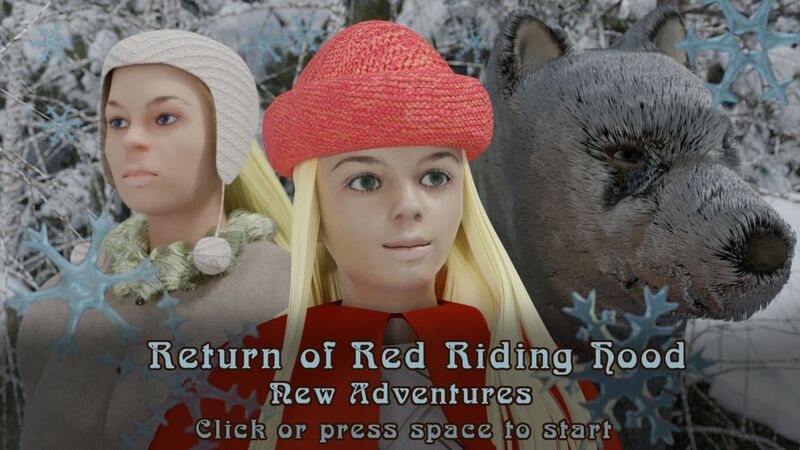 Thus, Return of Red Riding Hood, New Adventures is a combination of alternative realities. Turn of events depends on who will carry the pastries; Mother or Red Riding Hood, and on what filling for the pastries they will choose. Will it be meat or vegetables, will it be winter or summer and so on. This was the very first game we sent to Steam Greenlight which was simply called Return of Red Riding Hood at that time. While we were waiting for it to be greenlit, we released Return of Red Riding Hood in Google Play and itch.io. So when we finally passed Greenlight, we decided to make new adventures with the same setting for the Steam version. Because of high non-linearity it was hard to create long plot branches, so the game is not very long. That’s why we decided to make a bundle. 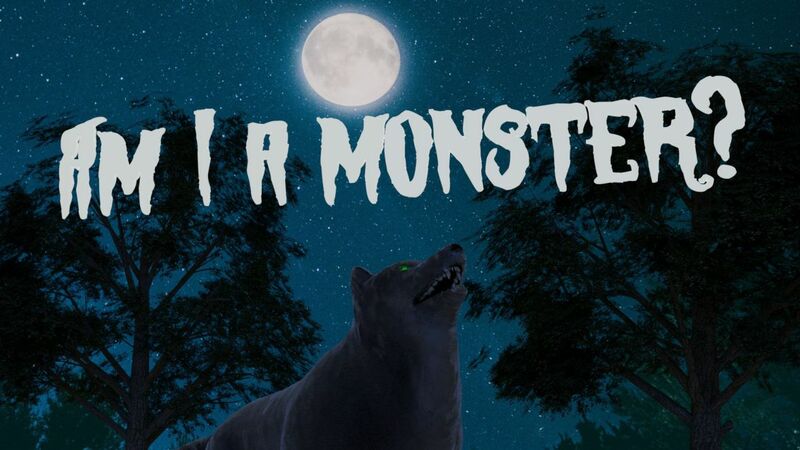 Besides, we had a game about a werewolf “Am I a Monster?” which was initially created for Ludum Dare. We made new pictures and added music to include it to our bundle. We spent some time, thinking about the main title of the bundle, because it should be informative, giving the player the idea of what games it contains. It was suppose to say that those are non-linear text stories with puzzles. One of the initial names was Non-Linear Book Hub, but we rejected it, because it said nothing about the puzzles and would give reference to game-books. Our games are similar to game-books (like Fighting Fantasy ones) but they are different. 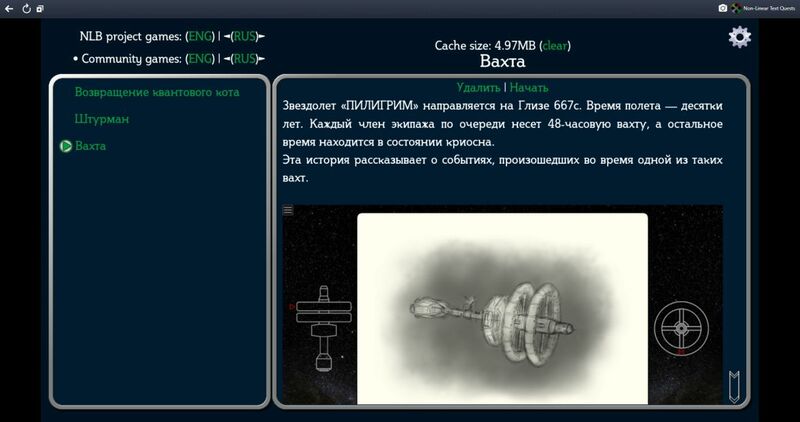 Another title we rejected was Non-Linear Text Games and finally chose Non-Linear Text Quests, because “text quests” word-combination is well known in Russia and creates correct connotation. 3. What sort of thought process went behind the artwork for this game? We chose 3d style because it’s cheaper than drawing pictures by hand from scratch. We use Blender 3d because it’s convenient and free. Of course it took time to study it, and there is still much more to learn. Blender helps to set lighting, shadows and other effects which artist has to calculate by himself. We also use MakeHuman 3d software for creating human characters. Simple interface helps to create a character rather quickly. Then 3d model can be exported to Blender to be used for further processing. 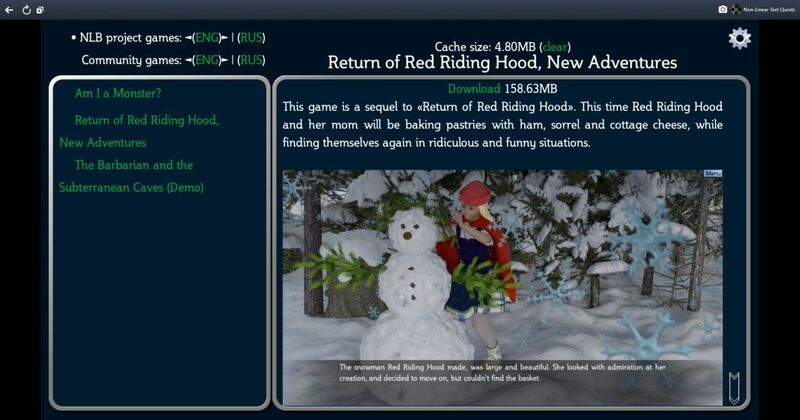 Return of Red Riding Hood, New Adventures is a sequel to Return of Red Riding Hood Enhanced Edition, based on the same idea, so the main challenge was to make new plot branches, which would keep the original spirit without copying events and ideas. Plus, we wanted to make funny stories without using the same jokes. We also tried to make pictures, text and music complementary to create proper sentiments and emotions. 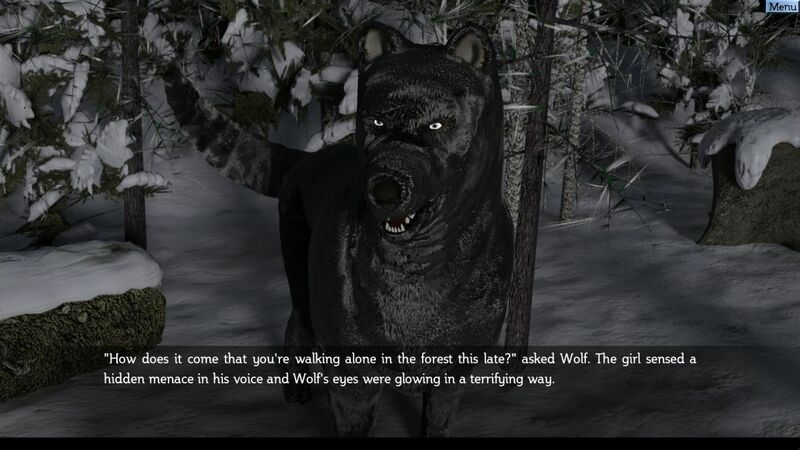 In Return of Red Riding Hood, New Adventures the basic objective was to make player laugh, whereas in the original game (Red Riding Hood Enhanced Edition) we sometimes wanted to scare the player or make him think. For example, in the scene where Red Riding Hood was walking through the deep snow, music was slowed down to show that the girl was tired and it was difficult to move forward. We would often use Skype to edit certain pictures together with the 3d artist, trying to make proper facial expressions on the characters and better placing of them in the 3d scene. We can say the same about the community games. The authors also tried to create proper atmosphere by choosing music and pictures. 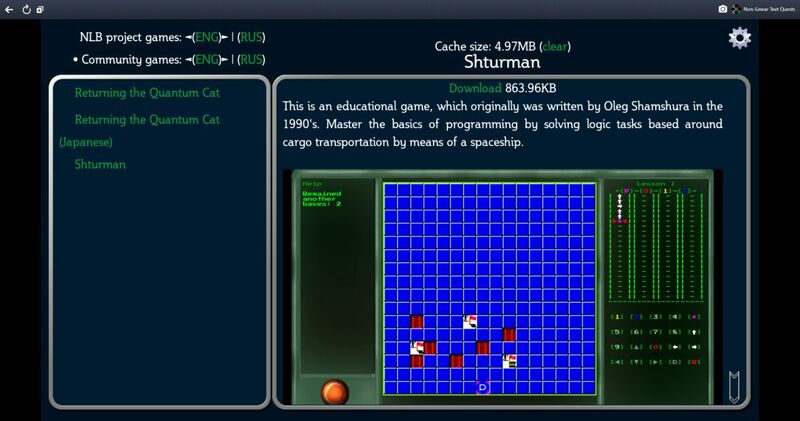 From the programmer’s point of view in the previous games we used INSTEAD engine the way it was, simply by adding our game there, without changing the source code. To make the bundle though, we had to change INSTEAD code by adding new functions, such as network functionality. Return of Red Riding Hood, New Adventures contains a lot of references to different products like films and games! We wouldn’t want to make spoilers, because players might want to find them by themselves. There are references to Papers, Please, No Man’s Sky, To The Moon, Dark Souls, Doki-Doki Literature Club and others. 6. Why do you consider Steam as a platform for your game and is there any other platform you look forward to get your game onto or already have? While working on the circulation of our bundle, we wanted to use as many platforms as possible. PC platforms are itch.io, Gamejolt, Steam. The bundle is also available in Windows Store and Google Play (together with INSTEAD-NG application). We’re also planning to release the bundle on Facebook Gameroom. Steam is currently the major platform for us, because we use it for quite some time and know what to do to be relatively successful when your game is released. Plus, Steam traffic, even without using additional advertising, allows the game to draw attention. It took us around 5 months to finish Non-Linear Text Quests. We are planning to develop the bundle by adding our games and games from other authors on INSTEAD engine. After the release we managed to add a few new games. 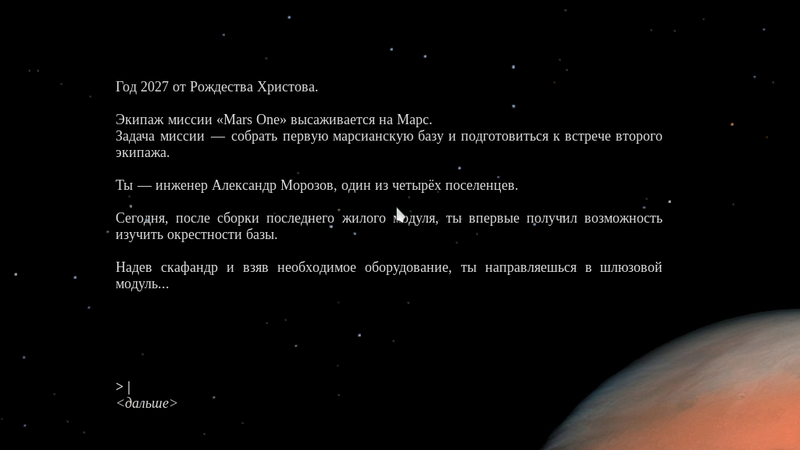 Those are games by Pyotr Kosyh “Another Mars” and “Mansion”. Furthermore, watching streamers playing our game demonstrated that the interface of the main menu in our bundle wasn’t very successful. We are planning to make a new, more intuitive and simple interface, showcase style maybe, to make it easier to pick a game. We are planning to keep making games. We’d like to switch from visual novel genre to something more like classic quests and adventure games like Myst or Shadowgate. We also plan to decrease the amount of text in our games by adding more gameplay and graphics. Text will be mainly used for dialogues and item description. We are developing games for about 4 years now. We like the creativity involved, the opportunity to express our thoughts and ideas. We love to communicate with other people through our games. Thanks to the games we got acquainted with interesting people, like the supervisors of Visual Novels and VN is Life Steam-groups; let’s players Diezel Game and Mike Panoots. Now we communicate through the social networks and follow their creative work. Our team consists of three members. I am the chief developer and represent our team in the press and social networks. My wife helps me, who is a script writer and her brother is responsible for 3d graphics and translation. Play good games which will keep you entertained and carry you into the world of adventures! Try Non-Linear Text Quests because it’s free to play. Plus, it’s not one game but the whole bundle, and we’re sure that everyone will find something there to his or her satisfaction. All the more we are planning to enlarge the bundle in the future. If you liked one of the games from our bundle, it would be cool if you leave a small review on Steam. We want to know your opinion about our product and, besides, reviews allow the games to become more noticeable in the store. And, of course, we take your comments into account when making new games. 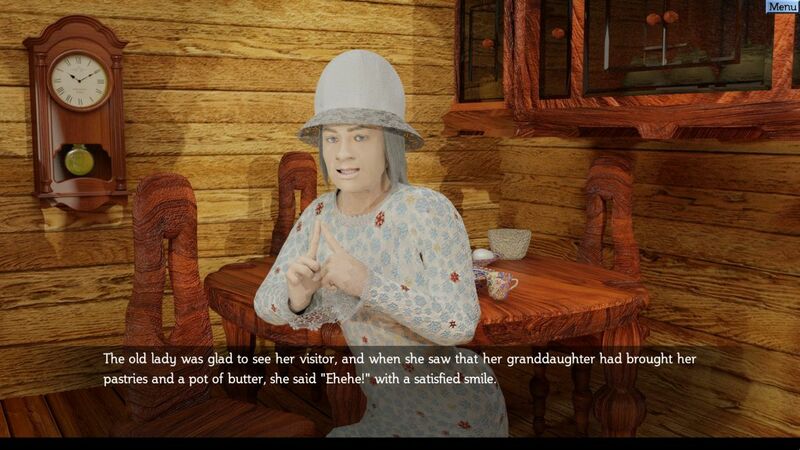 Perhaps, thanks to your review somebody will decide to download Non-Linear Text Quests. 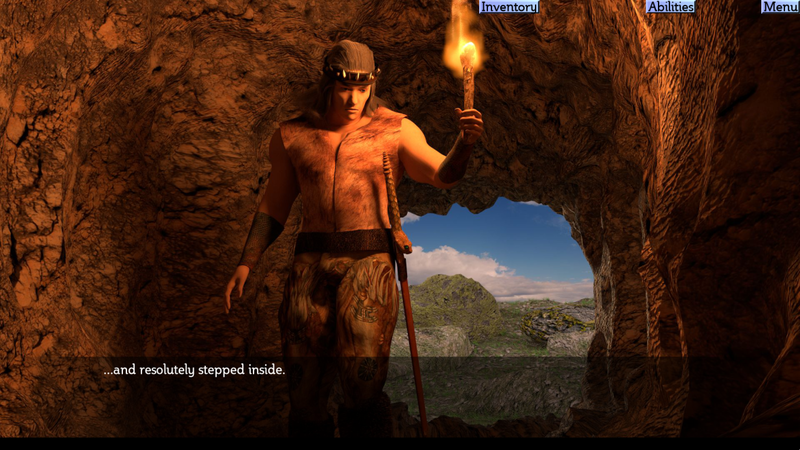 ← The Barbarian and the Subterranean Caves version 1.87 is here!